Now that I’ve been using Habitica for a while, I’ve found ways to use it that really work for me. YMMV. This is the far-left column. These are things that I do regularly or periodically that I want CREDIT for doing. I think of this as my “adulting” column. You’ll see my first thing in there is “Focus”. Do I do this even without Habitica? Yes, of course. But now I get POINTS for doing it. So it’s just this extra nice thing to reward myself for doing something I should be doing anyway. Most of the items in this column fall into that “adulting” bucket. As a fish owner, I need to clean the fish tanks regularly. As a book lover, I need to read books regularly. As an adult, I need to keep my living space clean. I always did these things. Now, I do them more regularly and with a little more happiness, because I know I’m getting credit for doing it. Points. Experience. Coinage. Quest progress. You’ll notice I’ve got a “Dry — Drink” option in here. When I choose to imbibe alcoholic beverages, I hit the minus (negative) button. I take damage, I lose XP, etc. This only affects me and not my other party members (we’ll get to that in a minute) but it’s a nice way to add a little stick to the carrot of getting good things when I don’t drink. The punishment isn’t so awful that I’m tempted to cheat, but it’s just enough to make me reeeeally decide if I want to drink or not. Below the cutoff of my screenshot, I have a second “bucket” of items in this column that are called “EXTRAS”. This is related to my daily quests — I get credit in my dailies for doing (for example) ukulele practice. If I practice TWICE in one day, I can click an “extra” bonus. That way I am still rewarded if I want to do more than my minimum. These are things I am dedicated to doing every single day. If I do not do these things, I will take damage (and so will anyone else in my party, more on this in a moment). My hobbies go here. Ukulele, writing, art, ASL, meditation. I had ample opportunity to do these things before Habitica but the simple truth of the matter is that I wasn’t doing them. Now, not only do I get CREDIT for doing them … if I do not do them, I will be negatively impacted. (Kristen, if you’re reading this, you’ll notice “Bumblebee” in that list. The pink kitten was finished this weekend and I’m waiting for both before sending them your way). I have exactly one modified rule with this, and it’s mostly because I KNOW I have a lot of dailies, and it’s a big ask to always finish all of them. IF (and only if) I spend an evening socializing with friends, I am allowed to choose a SINGLE daily and get credit for it. So if I play vidja games with Perry, I probably won’t have time to do all of them, but I still have time to do MOST of them. Maybe I don’t get in my ukulele practice that day, but I can check it off because I did SOMETHING good and I want to be rewarded for it. Some of you may find this a little confusing, but my introvert friends totally understand. Socializing (even wonderful, anticipated, joyous socializing) is a battery-drainer. It’s good for me and I love my friends, so I need to do it often enough to keep practice at it, but I DO believe I should be rewarded for it. Below the screenshot line I also have some items that I was doing … eh … sometimes? But definitely needed to be done daily. Like flossing. Or grooming the cats (mother of monkeys, Tiny produces so much wool, you guys). Or putting lotion on my tattoos. I don’t have the difficulty on these tasks very high, but getting rewarded for them means they get done, whereas before it was a lot more wobbly. Of special note are the two light blue tasks at the top of the list. 10 pushups and 10 rows. These came from a Challenge that I joined called “Pushme Pullme”. Another user somewhere in the world put together a group of tasks to help folks like me add a little strength training to their day. When I joined the Challenge, it added some Dailies and To-Dos to my board to help keep me on track. I also worked my way through a Financial Health Challenge and one that has me say “I love you” to myself in the mirror every day. 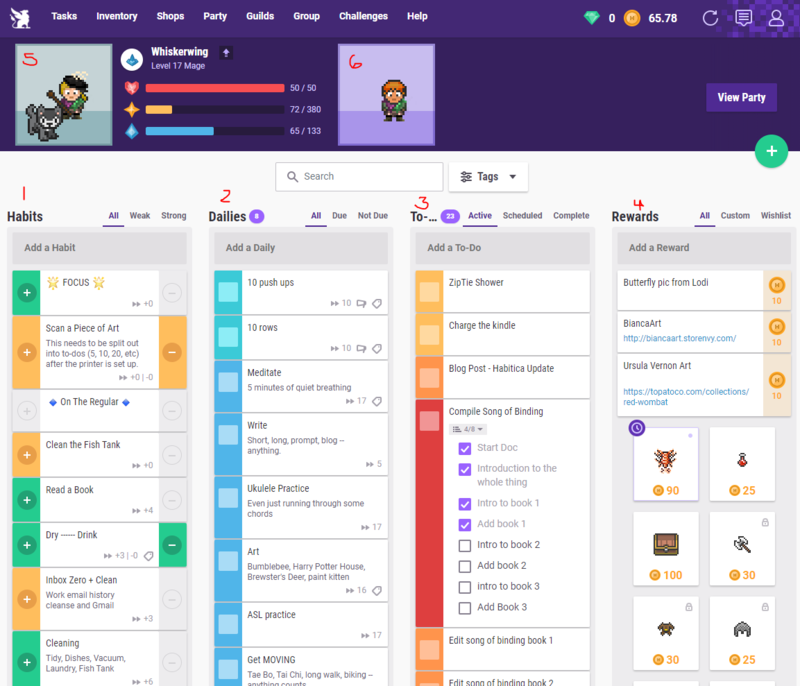 Challenges are great, especially if you’re looking to spice up your routine or aren’t really sure what kinds of things you can add to your Habitica lists. These are tasks that disappear after you do them. My shower caddy has been slipping forward and vomiting all of my shower supplies onto the bathtub for MONTHS. I need to spend two minutes with a zip tie and stop that from happening. I added this to my list today, and I’m hoping I remember and get it done tonight. (Why do I delay doing these things? No one knows, but I bet all of you have a thing or two that is in a similar state of perpetual procrastination). You’ll see THIS blog post listed. My fingers itch to mark it off, but it’s not done yet. I also have specific writing-related tasks that I need to get done, because “WRITE” is a useless command. “Compile Song of Binding Book 2” is a helpful, start-to-finish task that should be easy. The far-right column is my rewards. As I do tasks, I get in-game money. I can spend in-game money on gear that increases my stats, on quests for my party to do (I promise, this bit’s coming), and on random things that I set up for myself. I’ve got a few custom rewards at the top of my rewards column here. I want art from Ursula Vernon and Bianca Roman-Stumpff. There was a piece of art in a store nearby called Three Bats in the Belfry of a dandelion seeding off into monarch butterflies that I have decided needs to be in my home. I recently pre-ordered Let’s Go Eevee and the Poke-ball Plus, which was my reward for the Financial Health Challenge after I completed it. And below those, you can see the in-game rewards. Weapons and gear (including one piece that has a little clock icon on it to indicate it’s for a limited time only). SEE MY WOLF PET? Isn’t she adorable? I love her to bits. I found her egg while doing tasks, and hatched her with a “basic” potion (there are a RAINBOW of “wolf” options, depending on the hatching potion used). As I do tasks, I randomly find food as well. As a basic wolf, she prefers raw meat, but each hatching potion likes a different kind of food. (My zombie cactus pet likes rotten meat, ew). Once she eats enough, she will become a mount, and I can have a mount AND a pet in my avatar window. (Honestly, I like the look of the wolves so much that it might be the desert wolf who gets featured next. Hard to say). You might also see that I’m a level 14 mage. There are four classes you can choose in Habitica when you reach level 10. Mages level quickly and do a lot of damage to quest bosses, and I like the feeling of progress on a quest, so I chose mage. The other classes are warrior (also good damage, but has good defense against unfinished daily damage), cleric (heals the party against daily damage), and rogue (good at finding quest items and eggs). My avatar is wearing a “costume” made up of random equipment I own — mostly because the highest-stat gear I have makes me look like a boiled lobster, and I have SOME pride. The three colored bars are health (red), experience (yellow), and mana (blue). If I die (health bar all the way down) I lose an entire level and … something else. I dunno. I don’t plan on dying, lol. When the experience bar fills up, I level and get a stat point. (As a mage, I focus on INT and PER). The mana is used to cast my abilities. I have a boss-damage one that also gives me extra xp, and some buffs I can cast for my party (I swear, we are aaaalmost to the party explanation). Currently, my good friend Zack is trying out Habitica to see if he likes it. The dude next to my avatar is HIS avatar. There’s a whole different page where we can track our quest progress. (Currently we are on “Attack of the Mundane, Part 1: Dish Disaster!”, where we need to collect bars of soap). Every morning, we make progress on our shared quest, and when the quest is over, we both share in the rewards. If you go on vacation or just can’t even right now, you can go to the “Tavern” and suspend the damage from dailies. Even Habitica knows not everyone can be perfect ALL the time. I have … a LOT of stuff on my Habitica. I bet most people don’t have nearly this much stuff, and that’s totally fine. And I super duper like seeing a lot of progress, and setting it up this way really sets ME up for success. You can play Habitica with a single checkbox and nobody will turn their nose up at you.